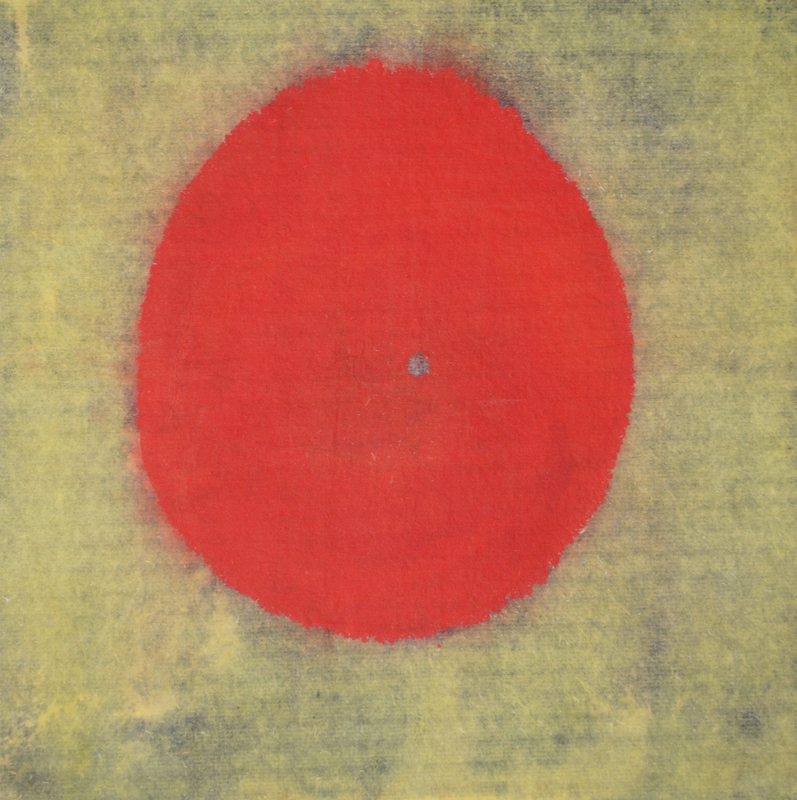 A blazing cadmium red-orange circle pulsates with mesmerizing force in Yeachin Tsai’s painting The Contentment of Mr. Orange (2015) from the artist’s series “Dot in the Space.” Compared to the small gray spot just off-center within its body, the orange circle looks unfathomably large, recalling graphic representations comparing the size of the Sun to the Earth. The orange form’s fuzzy borders give the sense that this monumental circle’s energy is ready to burst outward, a force countered only by the inward gravitational pull of its mass. Floating in a dull yellow and gray void, the circle seems to exist in a no-place and a timeless no-time, but its phenomenal impact on the viewer situates it in the here and now. As the retinas tire of the color’s intensity, the viewer begins to see its afterimage; the circle’s hitherto invisible opposite—always already contained within itself—is revealed with the unfolding of time. 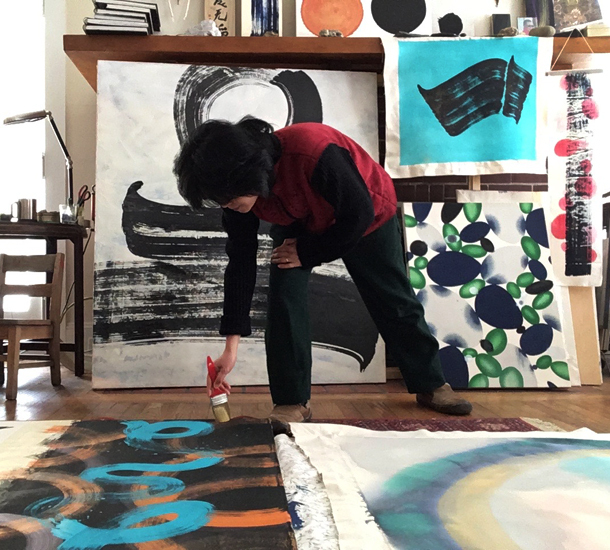 Circles recur throughout Tsai’s work. 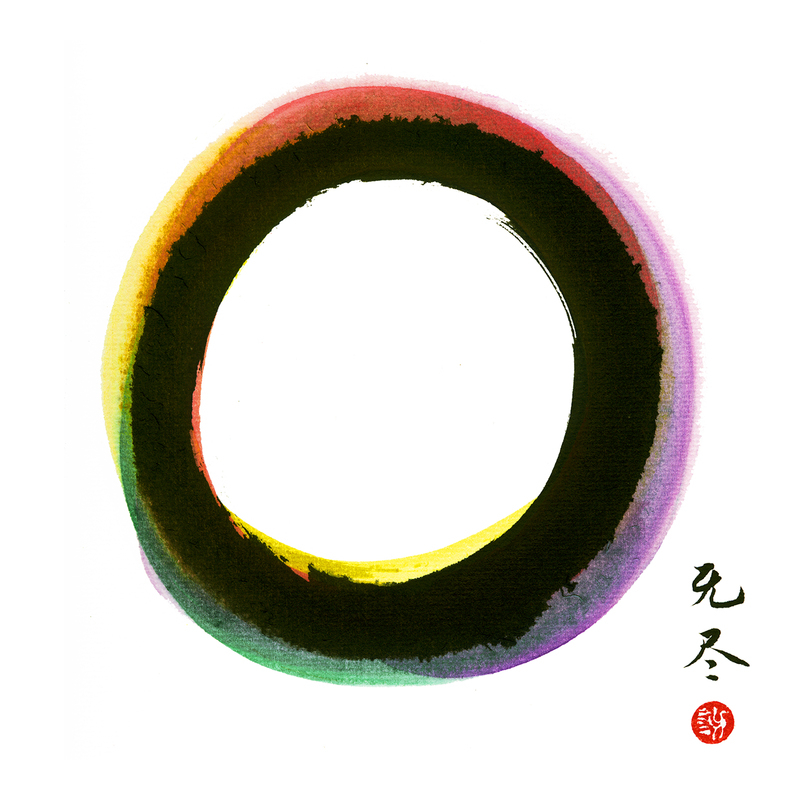 The circle, or ensō—an important figure in Zen Buddhist calligraphy—is a symbol of both emptiness and nowness. (2) The circle has also been deemed by many world religions to be the most spiritual of shapes because it has no beginning and no end. (3) Both of these temporalities—nowness and eternity—play a role in Tsai’s circles. In Eternal Nowness 01 a black sumi ink dot is nearly encompassed by a circle which, though broken, seems to complete itself across a void. 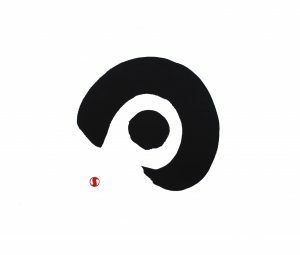 Tsai calls this “a primordial symbol without beginning or end.” (4) Following traditions in Chinese painting and calligraphy, the work also includes the artist’s red seal, itself a circle. A spectrum of color washes emanate from the black circle in Rainbow Circle (2015) which the artist signed “Endless” (無盡). Tsai’s circles compel us to rethink those two temporalities that we normally consider distinct, if not opposite. Nowness or the present moment carries with it the sense of impermanence, transience, and ephemerality; it is so fleeting that philosopher William James famously described it as “the specious present.”(5) By contrast, we associate the eternal (which subsumes and surpasses the present moment) with the permanent, the endless, and the monumental. 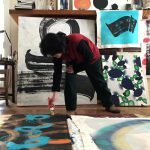 The tension between these two times structures the formal tension that animates Tsai’s works: her black dot and circle form a “primordial symbol without beginning or end,” but that symbol was also made in an instant, in a present moment now past, when Tsai had thrust her brush onto the surface of her paper. 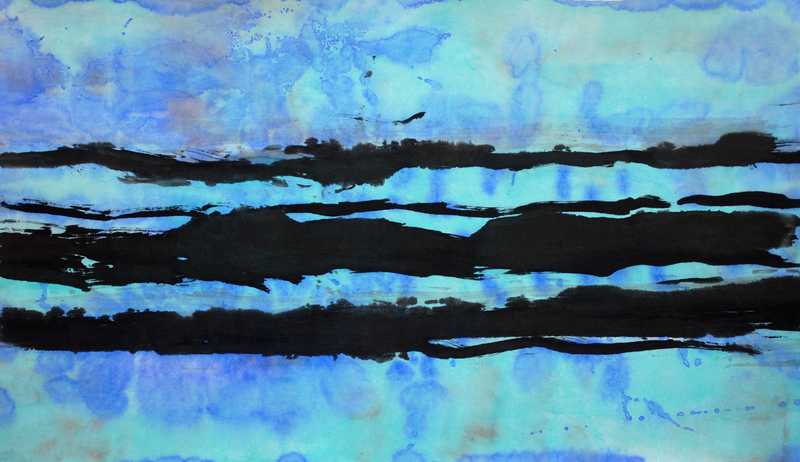 The gestural quality of her mark bears witness to the spontaneity and instantaneity of the dot and circle’s creation. Their fleeting moment of birth—now permanently embedded in the fibers of the paper—contrasts with the timeless and eternal voids surrounding them. As emptiness—but not nothingness—the voids in Eternal Nowness 01 and Rainbow Circle exhibit the same formidable presence of the orange circle in The Contentment of Mr. Orange. 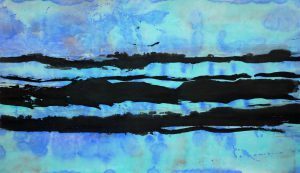 Artist Paul Klee wrote: “…the longer a line, the more of the time element it contains. Distance is time whereas surface is apprehended more in terms of the moment.”(6) Following the lines of Tsai’s circles in Eternal Nowness 01 and Rainbow Circle, around and around again, their paths never end; the time they embody is eternal. (The voids of Eternal Nowness 01 and Rainbow Circle act as surface in Klee’s model; they are apprehended in a moment.) However, time, especially in the west, is frequently represented as a straight line, a time line. In Tsai’s The Concept of Time from her “Icons” series, three such lines span the width of a horizontally oriented page. These are three multiple and parallel times, each partially fragmented by the gestural mark that describes them. They float above and through washes of a primordial blue atmosphere whose liquidity and dematerialization belie its steadfast omnipotence and omnipresence. Presented in triplicate, the lines of The Concept of Time begin to unravel the conceit of a unified and shared linear time. Furthermore, like Constantin Brancusi’s sculpture Endless Column (1938, Târgu Jiu, Romania) which seems to extend vertically in both directions infinitely, the three lines of The Concept of Time seem as if they continue infinitely in both directions beyond the edges of the paper. Given such a suggestion of eternity, Tsai’s timelines seem to share more in common with her circles than with traditional constructions of linear time. Typically the linear and the cyclical are two contrasted conceptions of time. The former is associated with the arrow of time moving in one direction, the latter with repetition. (Psychoanalyst and philosopher Julia Kristeva has described the ways in which these two modes have been engendered in the west, masculine and feminine, respectively, and has critiqued the problematic dichotomization which corresponds linear time to male transcendence and cyclical time to female corporeal immanence. (7)) Tsai’s work confounds such a dualistic conception of linear and cyclical time. The circle as employed in Eternal Nowness 01 and Rainbow Circle is itself a line, and as a line tracing eternity it is in fact a kind of timeline or linear time bent onto itself; like the circular ensō, Tsai’s three straight timelines in The Concept of Time are endless and their triplication suggests a kind of repetition normally associated with cyclical time. Confounding dualisms between nowness and eternity, and linear and cyclical, Tsai’s work inhabits a trans-temporal territory. While reading this article, I was reminded of the movie ARRIVAL and how it opened my mind to the vastness of no beginning no end.